So I am doing Nano this November. I have never done it before. It just always seemed like back timing for me with other things like work and other obligations. However, I have always had a strong desire to do it. The thrill of writing that much in a day with a deadline at the end. I wanted to see if I could win. Not sure that I will but I have a novel in mind to start, which will at least begin that project. It is my Haven series with this being the last in the trilogy. People do a lot of prep for Nano apparently. I don’t do things that way when I write, unless it requires research. However, I am embedded in this plot already via the previous books. I have the third lined out. I don’t think I have any prep than is better than the familiarity I have with this story already. It is also how I roll. At the end I will not be done. Fantasy novels average 120,000 words. So 50,000 will not be writing a novel for me, just a little less than a third unless I go over 120,000 a bit which I often do. So I won’t even be into the rock and roll awesome parts yet. Although this one does start off rolling right out the gate. I have been itching to get started for days now. Thinking over and over that first chapter. And various other important chapters. I dream about them. I think about them on my nights of endless insomnia. When i am thinking about something else entirely, the story creeps in and completely side lines my brain to thinking about it. I really need to be writing it now. Nevertheless what a hard task to complete. I think it ends up being 6 o 7 pages a day. You know like those good days where you just burn with ideas and you have the flow you are into? Like that every single day. I’m also doind NaNoWriMo for the first time this year, hoping it will be fun! Good luck with reaching your goals! At least you’re making the effort. 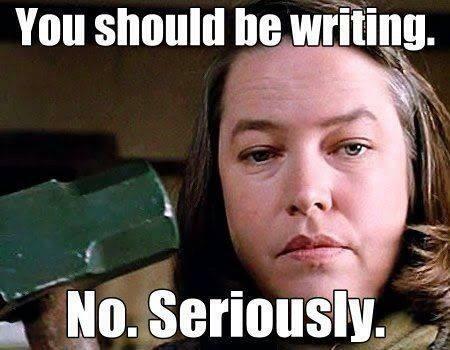 It seems like half of the would-be writers out there fail because they can’t be bothered with the actual writing bit. In my mind a flawed first draft is infinitely more valuable than the Perfect Chapter! That may somewhat influenced by the fact that I’m usually paid by the word, though. In any case, no matter how good the first draft is, you’ll be rewriting the whole book at least once before it’s ready to be published. Charge blindly ahead! Ha, no kidding! All those silly, pointless mistakes . . . Ugh!